Fall is officially here, and Halloween is just around the corner. October is hands down my favorite month of the year. We spend our Friday nights watching fun, spooky movies and our Saturdays out in the yard raking leaves, jumping in them, and playing fall games! 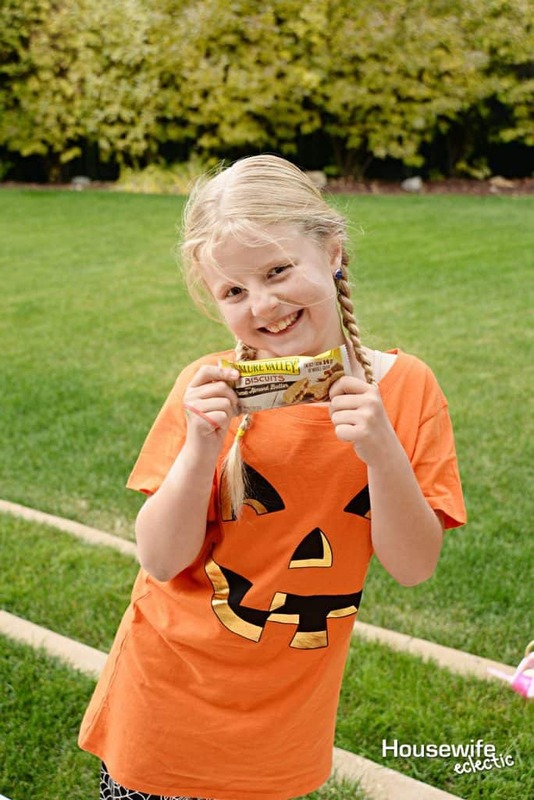 One of our favorite prizes for our Halloween games are the Nature Valley Biscuits. These delicious biscuits come in Cocoa Almond Butter, Almond Butter, Peanut Butter, and Coconut Butter, and are full of flavor! With two whole grain biscuits and nut butter or coconut butter on the inside, these are the perfect snack for our busy fall days. My kids’ favorite variety is Cocoa Almond Butter. With just the perfect hint of chocolate, my kids actually ask for these over candy. I will take that any day. I love putting Nature Valley Biscuits as the prizes in some of our games, like Poke a Pumpkin or Spider Web Balance Beam. The kids love them and it cuts out some of the candy from the Halloween season. Speaking of games, here are our favorite Halloween games! 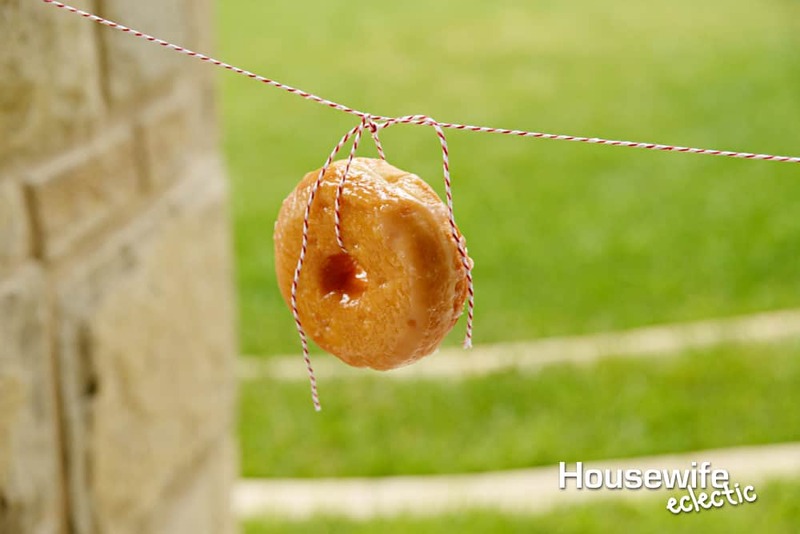 Tie glazed donuts to a string, then tie the string to a tree. You can even tie them to a broom between two chairs if there aren’t any trees in your area. The goal of the game is to be the first person to finish your entire donut without using your hands. The donut will move around as everyone tries to finish their donut, making it a fun game to watch and be apart of. Grab 3-5 witch hats and stuff them with newspaper so they will stand up on their own. Place them on the pavement and put a piece of tape on the ground about three feet away so the kids know where to stand when throwing their rings. If you are playing this game with teenagers, you can slowly move back the piece of tape to make the game increasingly more challenging. For the rings, I prefer to use glow-in-the-dark bracelets because they are a good weight, and nice and rigid. This is a great game for any age. My toddler loves it, but it can be a lot of fun for teenagers too. Fill a cup for each child at the party (or in the classroom) with fun prizes and treats. 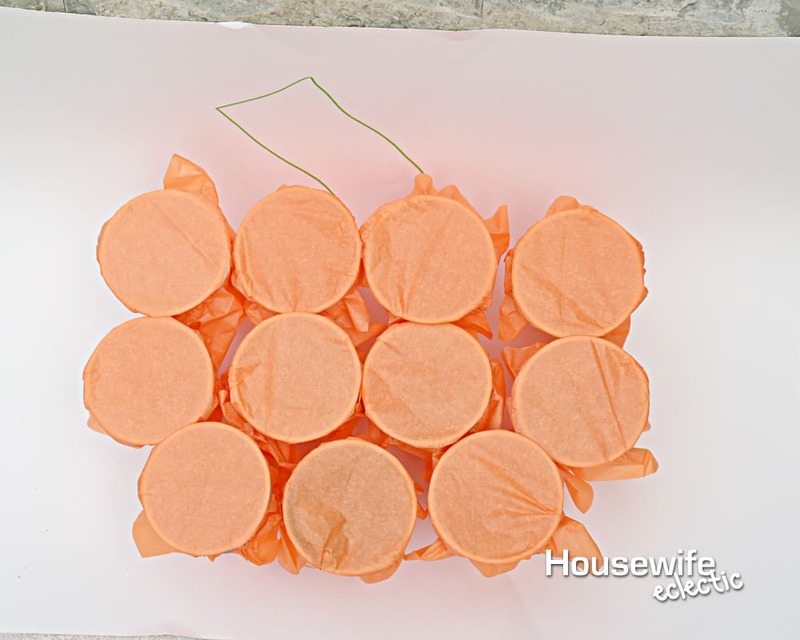 Place tissue paper over the top of the cup and add a rubber band to help the tissue paper in place. Glue the cups to a piece of foam core in the shape of a pumpkin. Add a piece of green paper to the top of the pumpkin to make it look more like a pumpkin. To play, each kid gets to pick a cup then punch their hand through the tissue paper to claim their prize. This game is always such a hit and every kid gets a prize! This is the perfect game to use Nature Valley Biscuits with Cocoa Almond Butter as the prizes! 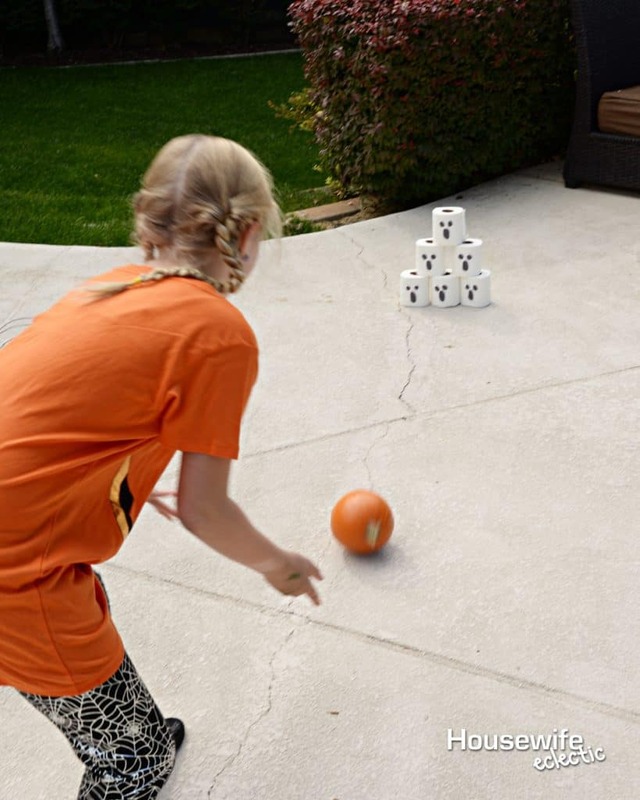 This classic fall game is always good for plenty of giggles. Fill a large bucket with warm water and put about a dozen apples (or however many will fit in your bucket) on the water. The apples will float and the kids can take turns catching apples using just their teeth — no hands allowed! This is a Halloween twist on a party favorite. 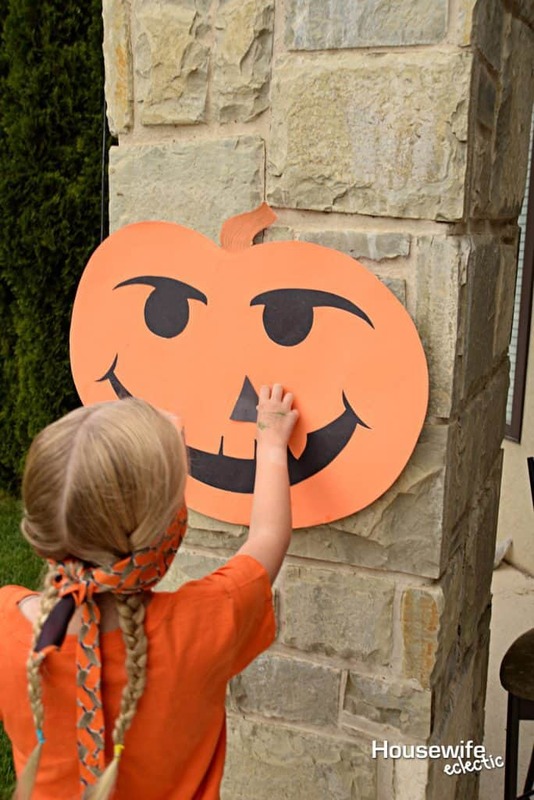 Cut a large pumpkin out of a piece of orange poster board. Draw the eyes and mouth on the pumpkin, but leave the nose area blank. Cut noses out of black construction paper and add a piece of masking tape to the back of each mouth. Blindfold each kid in turn, place a mouth in their hand, and have them try to place the nose in the right place. Draw a large Tic Tac Toe Board on the ground with chalk (if you are outside) or use masking tape if you are inside. 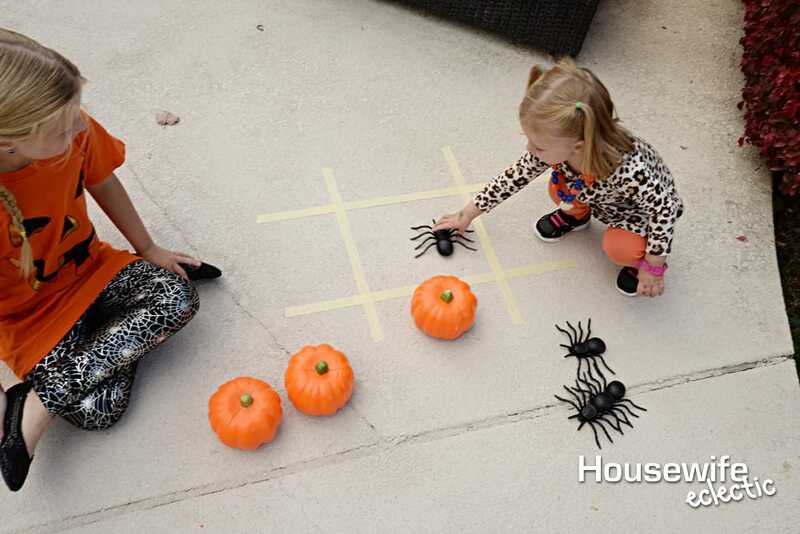 Play typical Tic Tac Toe, but one player is pumpkins and one is spiders for a spooky take! It is just like typical limbo, but with a witch broom! How low can you go? Make a spider web on the ground with masking tape. Place spiders and favors in the center of the web for the kids to try and grab without falling off the web. If you are doing a party with older kids, spread the web lines farther out from each other to make it hard to grab the prizes. Hot glue small witch cauldrons onto a piece of black foam core in a triangle pattern. Give the kids ping pong balls and have them try and bounce the balls into the cauldron. Give each team a roll of toilet paper. Each team picks one person to dress up and they must use the entire roll of toilet paper to make them look like a mummy. 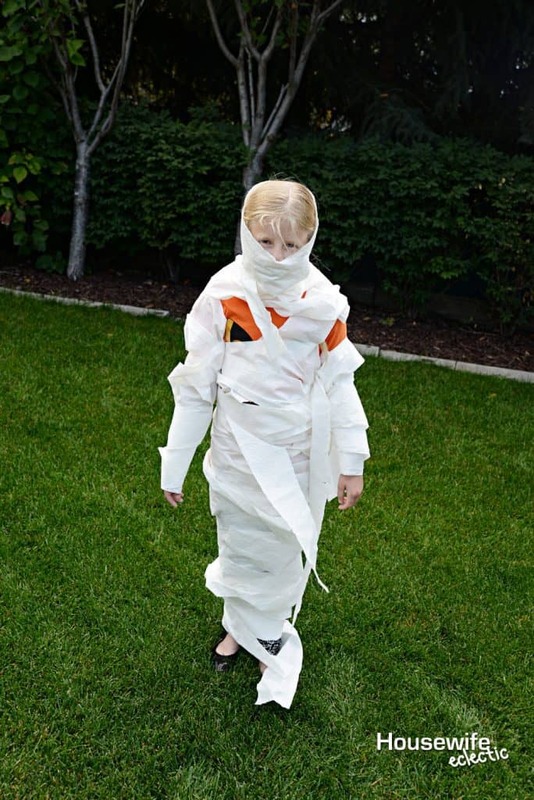 The first team to dress their mummy and have the mummy run to the finish line wins! 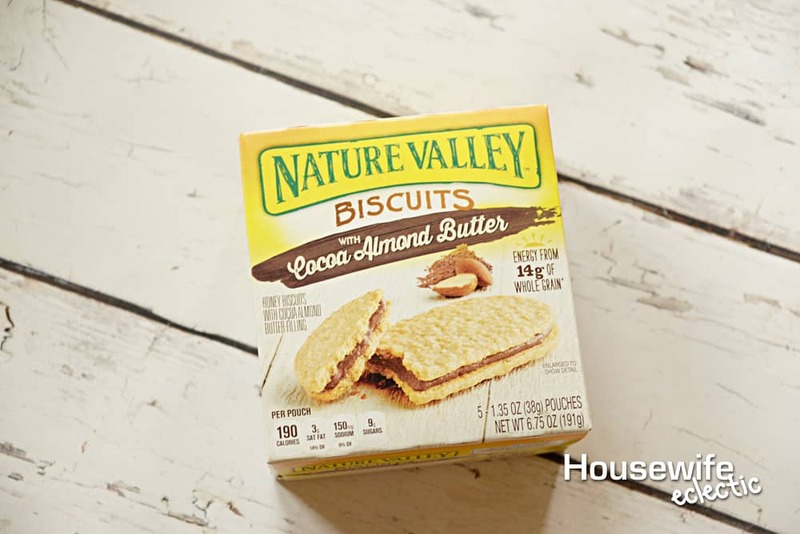 Which game would you use Nature Valley Biscuits with Cocoa Almond Butter as a prize for? 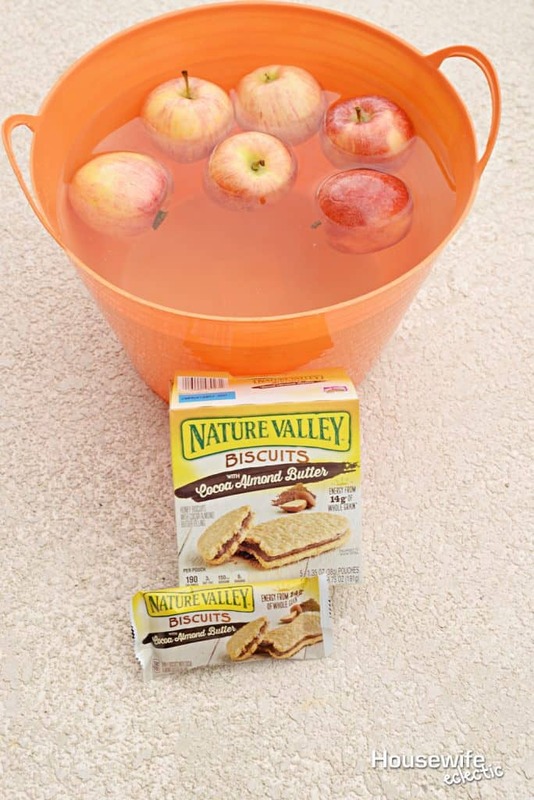 Bobbing for apples never goes out of style! Kids of all ages love this game. 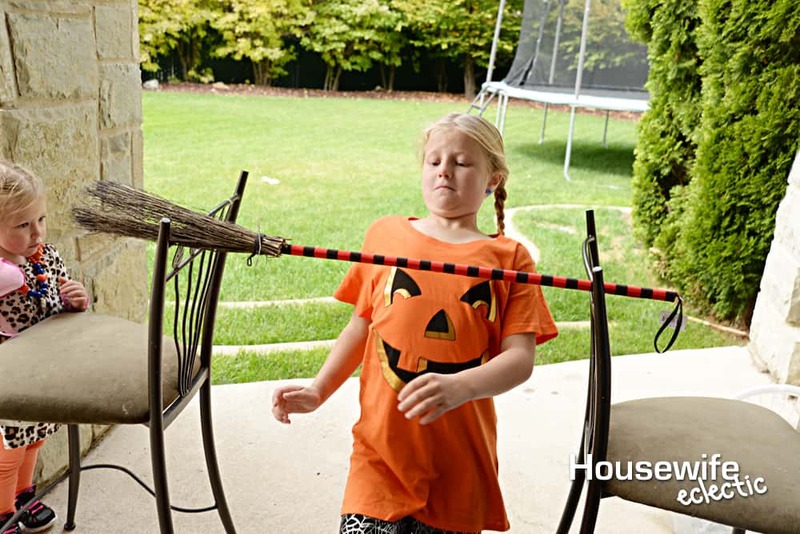 These are all really fun games to play at a Halloween party. And the snacks look awesome too. The mummy wrap and eating donuts hanging are always popular. Heck all the games are fun for all ages. These sound and look like some fun games! I’ll have to play some with my kids. I know they’d love that donut one. 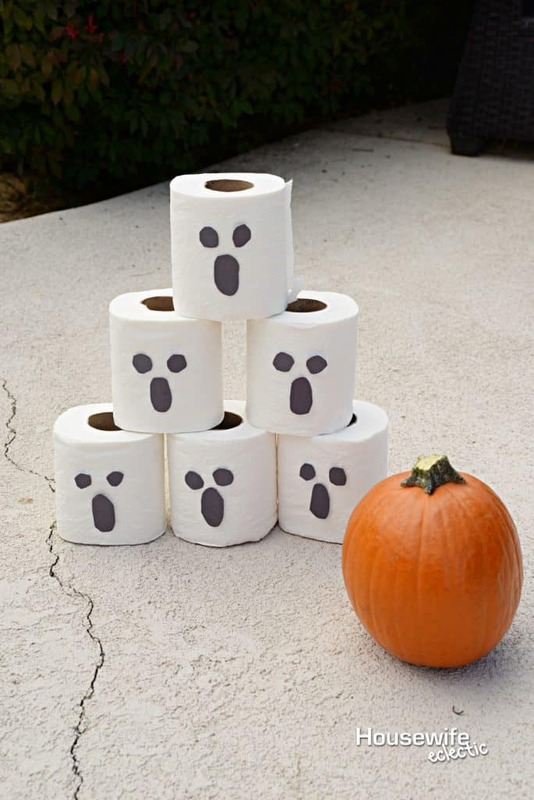 These are such fun ideas for Halloween parties. I love the bowling one. We will be using a few of these on Halloween. I love doing little parties right before trick-or-treating. This would be a fun way to get the night ramped up and ready to go. Pumpkin bowling looks like a lot of fun. I need to try a donut race with th kids. These are so simple! I love these ideas for a fun family night. These are all some really fun/great ideas! 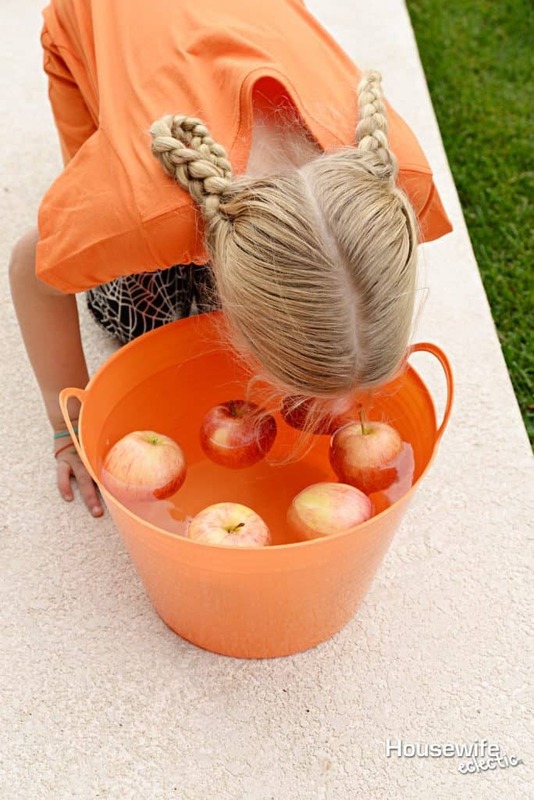 Bobbing for apples is such a classic. We love those Nutri Grain bars, and find that they are the best snacks anytime. These are such good ideas! I need to have try few of your outdoor games this year. Pumpkin bowling could definitely work. These are all such fun ga,es for Halloween. 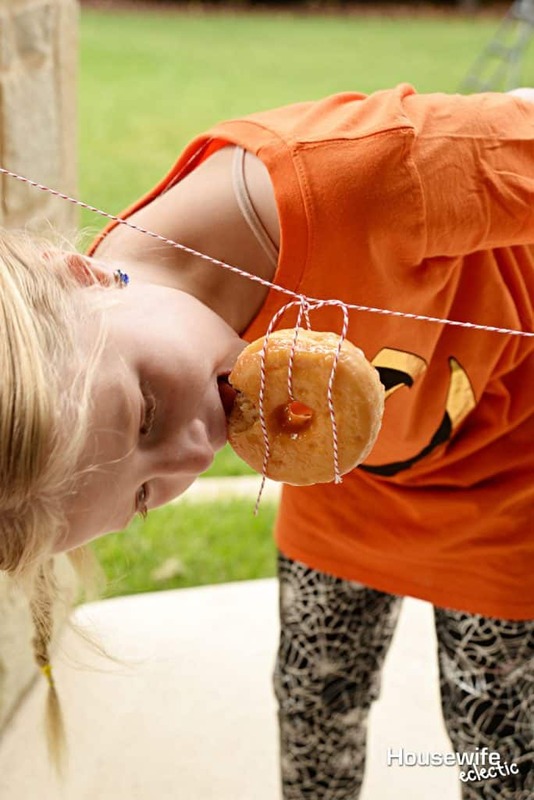 I always loved bobbing for apples but I think the donut race might be even more fun. What fun ideas! Our town’s Halloween parade is this weekend, and the kiddos want to have a party to continue the fun. These will make great party games. 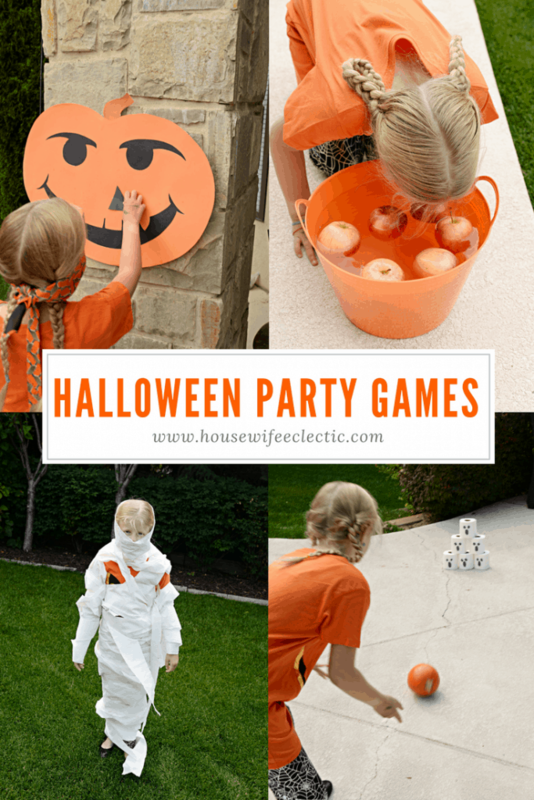 These are all great Halloween Party games!! My niece is having a Halloween birthday party this weekend and I will have to show my sister this post! These are great ideas. I love the pumpkin bowling the most and oh the tic tac toe would be my kids pick for sure. I love what you did for the Tic-Tac-Toe game, cute idea! One of my daughter’s classroom parents was just asking for suggestions to freshen up the yearly Halloween party! These games can be played my people of all ages! Oh my goodness, this would be so much fun! The one I like best would be the donut race and the dress the mummy. I will bring up this idea so me and my family would have some fun on Halloween. These are really some fun games. The kid within me is really excited. The Donut race looks great, the donuts are the incentive of course.